One week from last meeting, we all have some improvements on our design or prototype. Something special for this week’s meeting is that we finally meet in person. It has been a while for us to meet online. Among the 5 members, each of us have worked on our own design. However, there are two very similar design, so we will just see it as the same category. Our four main concepts are 4 bar linkage, butterfly (which means it has two flipping pad on the side), flipper, and the rotating plate. Starting from one of the flipper design, it is made from a safety buckle. When it was purchased, the maximum angle between the two major parts is less than 180 degree. In order to make it turn like the actual pad flipping around the shoes, which is about 270 degree or more. Our member destruct the original product and 3D printed a similar part to replace the turning part, and allow it to open up a wide angle. Another element needs to be added is the mechanism which will turn back the flipper. The extension spring is used in this prototype for the major force. Also the position of this prototype is set to be at the back of the shoes. For the other flipper, the torsional spring is used and the whole device is placed in the front of the shoes. This prototype has been tested on the ice surface and there isn’t enough friction only having the spikes in the front. The 4 bar linkage design is shown by the solidworks model and animation. The device is on the side like the butterfly. We decided to try it on the back of the shoe next time. 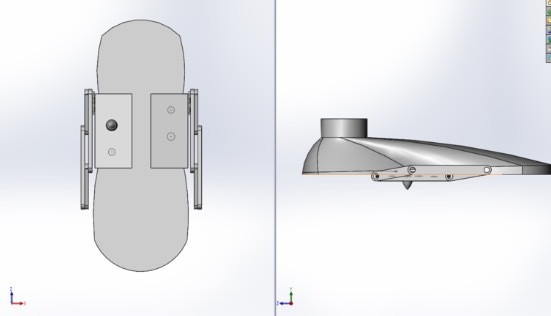 The conclusion of this meeting is that the two flipper should combine, all the prototype needs to be more realistic, and if the other designs are not feasible after the careful calculation, those members should work on the linkage design as well. Registering on this website will provide students with access to the student handbook which provides guidelines for the senior design projects program. Click here to register. Some of the projects would not have materialized if not for the generous support of our donors. Click here to donate.